Can you believe it’s the middle of November already? This year sure has gone by quickly. 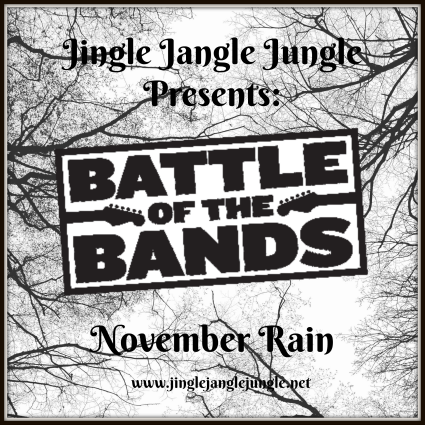 It’s also time for the monthly Battle of the Bands. I’ve been giving this one some thought, and being that it’s November, I really can’t think of a better song than this one. "November Rain" is a power ballad by the American hard rock band Guns N' Roses. Written by the band's lead singer Axl Rose, the song was released as a single in 1992 from their third studio album, Use Your Illusion I. It features a sweeping orchestral backing and is one of Guns N' Roses' longest songs. Today, I’ve got three different contenders for you to choose from. Each one hails from a different country. Each one brings something a little different. Give each of them a listen. Try not to be influenced by the videos. Cast your vote for the contender you like best in the comments. Steve 'n' Seagulls is a Finnish country band, playing bluegrass versions of well-known hard rock and metal songs. The band became known in the summer of 2014 with the publication of videos on YouTube. Especially popular was the band's version of "Thunderstruck" by AC/DC which received over 42 million views on YouTube. The band's debut album Farm Machine was released through Spinefarm Records on May 8, 2015. In November 2015, Steve 'n' Seagulls were featured on The A.V. Club Undercover covering "Sabotage" by the Beastie Boys. On August 3, 2016 they released a cover of Aces High promoting their second album Brothers in Farms. Steel Ape is a heavy metal band from Uruguay, South America formed in 2011. Andreea, Patricia, Bianca and Naomi are appreciated as artists in Romania. Each of them had collaborations with other artists and now they follow their passions and are involved in beautiful projects: Naomi’s passion is Jazz, Andreea and Patricia each of them have their own solo show and Bianca, beside being a student at the Music Academy she is also an international top model with a lot of prizes, including at Cannes. The girls are spoiled by the mass media and they have weekly appearances in the glossy magazines, newspapers or TV shows. Please vote for the contestant that you like best in the comments. Voting will end on November 21, 2017 at 6pm EST with results being posted on November 22. I couldn't recall this song and the first version didn't help to jog my memory. I really like that version a lot. It just goes in weird cool directions. Steel Ape got me to remember. Their version is kind of good for what it is, but there were some moments that made me cringe. I pass on this one. I'm very fond of string quartet music and Amadeus is very good. The climax to the song is spectacular. I'd likely pick this version if it weren't for Steven Sea'gulls. I thought there was such an interesting dimension to that one. The Finnish group gets my vote. That was a very cool round. Who'da thunk it the Finnish Hillbillies getting the first vote in the battle. You're right they are awesomely spectacular in a very strange way. I tried to avoid using them in the battle, but I find something odd and compelling about them. I, too, enjoyed the string quartet, and yet Steel Ape offers a third version. Each of them interesting. I am really looking forward to seeing how this one turns out. I almost went with Guns N' Roses "November Rain" but decided against it. You took the song choice to an interesting level using three foreign bands with distinct styles. I'm in total agreement with Lee's assessment of the artists and as much as I like Amadeus, I actually prefer Finnish hillbillies. Maybe, it's my country mewsic upbringing calling my ear to Steve 'N' Seagulls! There is just something about that group. You should check out some of their other covers. Very interesting. Wow! Bluegrass from Finland? That is so interesting, Mary! ☺ For sure, I thought the heavy metal version would attract the most, but no! The vocals sounded strained, to me. Then there is Amadeus. The ladies did a great job with this. Here's the surprising thing: I've never been a big fan of Bluegrass, but am drawn to the vocals and arrangement by Steve 'N' Seagulls. Finnish Bluegrass, it is! I think quite a few people can relate to the heavy metal version, as it seems closest to GNR in my opinion. But the other two are just really compelling as well. Thanks for the vote! If I were basing this on band names solely, Steve 'n' Seagulls would win hands down. And actually I liked their arrangement very well. But The Amadeus Electric Quartet's version of this just blew me away. They're getting my vote here. First vote of the battle for Amadeus Electric Quartet! I am a bit surprised by the turnout so far. I thought for sure no one would vote for those Finnish Hillbillies. nice going here Mary! Fabulous battle with an incredible song pick. Those Finnish hillbillies are interesting for sure but they just didn't do it for me. Love the band name though, Steve 'n Seagulls. Clever! Steel Ape does an okay job with the song but it's just like going to a bar and seeing a cover band. They didn't really do anything but copy the song. The Amadeus Electric Quartet were A-mazing! At first I was disappointed that there were no vocals but it soon became apparent that vocals are completely unnecessary with this group. Their talent with strings is incredible and their version moved me to another plane. That song does that anyway: GNR's version sets me on a ballad sail throughout the whole song and I come back to port feeling wow'd. That's what the Amadeus gals did for me. It was fantastic. They get my vote, hands down. Really awesome battle. And thanks for the introduction to the Amadeus bunch. I'm definitely going to check out more of their stuff... They are talented for sure. Just wait until you see what I have going on next month! I thought this battle was 'just okay'. But it was fun nonetheless. This is a great battle Mary. Not everyone will like the first selection by Steve and his Seagulls. It might be too well off the original mark for them. Too twangy or or country or something, but that is what it makes it such a fantastic cover IMO. They took that song and made it their own. I fully expected to vote for them. Steel Ape didn't veer so far off from the original, which might be just the thing for some of your listeners, but not for me. But, the big surprise for me in this one was the Amadeus Electric Quartet. I don't tend to vote for the instrumentalists. But wow. They were awesome. I really loved it. I am really quite surprised by the votes this time around. I appreciate you taking the time to drop in and cast your vote. I'll be revealing the outcome next week and I'm sure there will be some surprises. I thought the STEVE 'N' SEAGULLS recording was terrific! I liked it immediately, upon the first hearing (and that doesn't often happen for me). With Steel Ape, I knew they were in trouble with me the moment I saw they had a sheepdog playing drums. Then as soon as that guy in the copycat Axl Rose costume started to sing, they were OUT OF THE RUNNING for me. 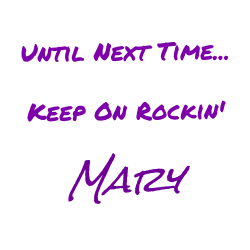 Good Battle, Mary. And I'm looking forward to your next one. You've got me very curious now. I included Steel Ape, for those who might be looking for a heavier sound, but so far they are getting no love from the readers. Amadeus Quartet is impressive. I enjoyed the scenic video. Right now, the battle is neck and neck between the hillbillies and the instrumental, and that is just blowing my mind. BTW, those Finnish Hillbillies have done quite a few covers. You should check them out sometime. Thanks for droppin in, and especially thanks for keeping me in your prayers. I still don't have anything definite, but it's getting closer. I listened to the first two versions and wondered how I'd decide. Then I reached Amadeus and knew I had found my choice. They are talented ladies. Another vote for Amadeus :) Thanks for stopping by! After listening, I was hanging on the edge of the fence, ready to keel over towards Steve-N-Seagulls then I heard Amadeus Electric Quartet, and I leaned that way. How could I like two so different? How can I embrace two wildly different plunky plunks? I'm just weird. Give it to Amadeus! Sometimes it's the different that makes it unique. Excellent choice (although any other choice would have been just as good). I think this was a good battle in that the very different sounds of the same song are pulling everyone in different directions. Appreciate you stopping by to cast your vote. Have a Happy Thanksgiving! You surprise me, Mike! Somehow I had you pegged for Steel Ape. This has certainly been a fun battle!